Lights. Camera. Mayhem. You won't find this story on television. Jeff Lindsay's razor sharp, devilish wit, and immaculate pacing prove that he is in a class of his own, and this new novel is his most masterful creation yet. Jeff Lindsay reads from Dexter is Delicious. 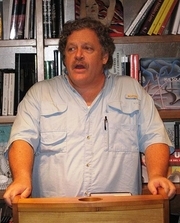 Jeff Lindsay is currently considered a "single author." If one or more works are by a distinct, homonymous authors, go ahead and split the author. Jeff Lindsay is composed of 10 names. You can examine and separate out names.